Hi, my name is Lisa Rupp and I love to work with all kinds of art materials, and in all types of mediums and techniques, thus the mixed media part. As a retired elementary art teacher, time to create my own art work has become more available, so I try to MAXIMIZE every moment! 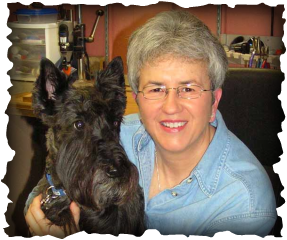 And then there is MAXwell, my Scottish Terrier……he’s always a part of the act! I’ve been creating my Funkie Junkie Friends, Junkyard Dogs, and Alley Cats for several years, but the found objects, antiques, hardware, and just plain junk have called my name for as long as I can remember! When the thrill of the hunt, the perfect find, and the joy of creating, all come together…. it becomes a passion and I can’t wait to make more! Click here to check out Mixed Media Max being featured on HGTV's Good Bones/Two Chicks and a Hammer Facebook page and Sunday Sway video! No shows scheduled at this time.